Bring years of comfort, style, and convenience to baby’s nursery with a 3 in 1 convertible crib. The following five 3 in 1 convertible crib combining comfort with safety will be a great addition to any nursery room. With the great features like adjustable mattress levels, simple stylish look, sturdy construction and more, these functional convertible cribs will make both you and your baby comfortable. 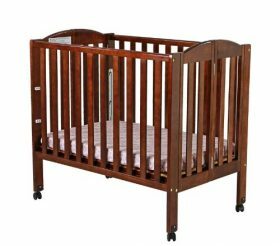 Made of solid wood with a beautiful, glossy non toxic finish, the Nadia 3 in 1 convertible crib is a nice addition for a nursery. This 3 in 1 crib offers 4 level mattress spring adjustment to adapt to child’s growth. It converts to a toddler bed with included guardrail and a full size bed, conversion rails not included. 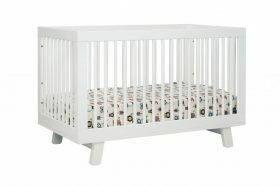 Durable, sturdy and stylish, this convertible crib is perfect for any type of nursery. Meets and exceeds US federal safety regulations. Good quality, modern and functional, the babyletto Mercer 3-in-1 Convertible Crib will become one of your best baby products. The Mercer Convertible Crib comes with four adjustable mattress positions and grows with your baby, converting to a toddler bed (rail included) or daybed. It also features an extra drawer to keep baby’s essentials close at hand. Made from sustainable New Zealand pine wood, this durable and solid convertible crib will provide years you use. 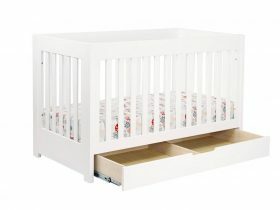 Add a simple charm to your baby room with the babyletto Hudson 3-in-1 Convertible Crib with Toddler Rail. 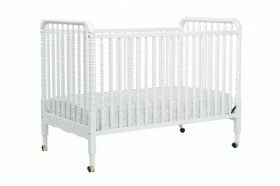 This convertible crib converts to both a toddler bed (rail included) and daybed. It features all-spindle sides allowing you to keep an eye on baby from all angles. The four adjustable mattress positions will maximize comfort and safety for both you and baby. Non-toxic finish. Lead and phthalate safe. 3 in 1, portable, easy to assemble, the Dream On Me 3 in 1 Portable Folding Stationary Side Crib will make both you and your baby happy. The United States patented rail system easily converts crib to a changing station or playpen in seconds. It offers 3 position mattress support for maximum comfort. The stationary (non drop side) rail system provides the utmost in product safety. One hand folding for flat, compact storage. All tools for easy assembly included. Reengineered for safety and convenience, the Davinci Jenny Lind 3-in-1 Convertible Crib is just right for baby. It comes with all stationary sides for safety, as well as four adjustable mattress levels to make reaching in for baby easy on your back. This timeless crib also grows with your little one since it can easily convert to a toddler bed and then a daybed. 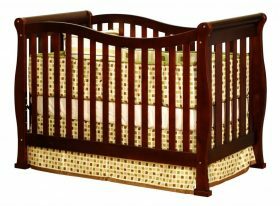 Offering style, quality and comfort, the Jenny Lind will be the centerpiece of your nursery for years to come.